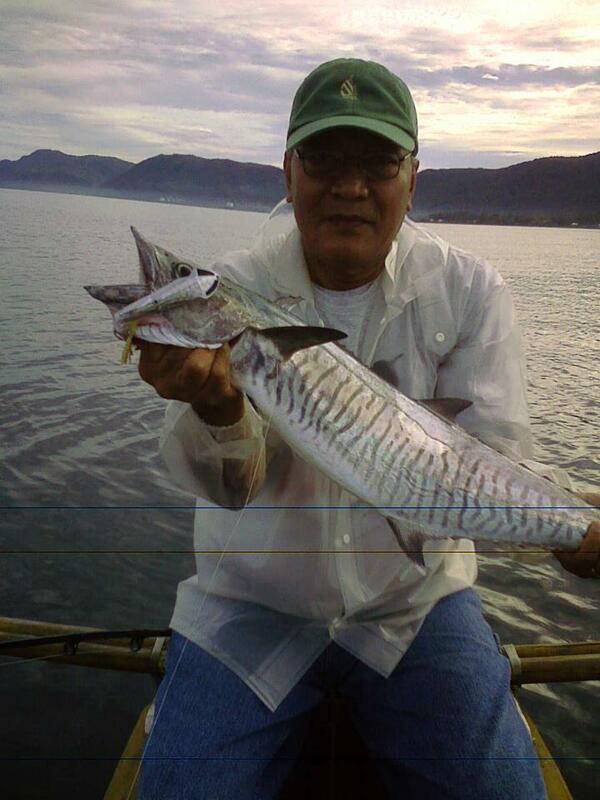 This is a very popular gamefish here in the Philippines which I have not yet caught. This is Chito with his 11+ lbs Spanish Mackerel. This fish was taken on a large trolling spoon trolled from a Pump Boat or Banka. These fish (and various other related species) are known throughout the Philippines as Tanigue or Tangingue. They are sought mainly by trolling lure such as; large spoons, large Rapala-like minnow lures, Squid Skirts, live bait, dead bait, and various other lures. These Macs can grow quite large, up to 30+kgs, though most caught around the Philipines are around 2-10kgs. They lurk near reefs, and other structure and feed on smaller fish and squid. Good times for trolling for these fish are at sunrise and sunset as that is when they are most active. When fishing for Tanigue be sure to use a heavy mono (or fluoro) leader 0r a steal leader as these fish have razor sharp teeth. Posted on May 28, 2012, in Mackerel (Tangigue) and tagged Mackerel (Tanigue). Bookmark the permalink. Leave a comment.